Frontline, the pioneering PBS documentary series, recently aired an episode, New American Nazis, that shows in terrifying detail how white supremacist-fascist-neo-nazis are attempting to infiltrate the U.S. military and domestic law enforcement agencies. If you have read about the rise of the Nazis in Germany in the 1920s and early 1930s, you know the same thing happened: violent, angry young men who joined militias in order to learn weaponry skills they intended to utilize to undermine the legitimate State, install their own authoritarian Fuhrer, and impose their racist-nationalist views on Germany—a plot at which they succeeded. The origins of QAnon are obscure. NBC describes its main objective as “leak[ing] intelligence about Trump’s top-secret war with a cabal of criminals run by politicians like Hillary Clinton and the Hollywood elite.” With no known structure or leadership, QAnon brings to mind the 1999 Brad Pitt-Edward Norton movie, Fight Club, a similarly loosely connected, underground organization whose anarchist members recognized each other through their bandaged wounds and oblique references to the group’s [semi-fictional] leader, Tyler Durden. QAnon, for all its anonymity, has its own Twitter hashtag, #QAnon. Among other tweets are one showing that Fox News’ propagandist and Trump supporter Sean Hannity reported that “at least 6 #DeepState spies made entrees to key figures in the Trump org/campaign…in an attempt to set up candidate/President Trump with a concocted Russia narrative,” a “concoction” that now is being shown by Robert Mueller as being entirely too true. QAnon members also have a way of recognizing each other: by wearing or displaying various forms of the capital letter Q. 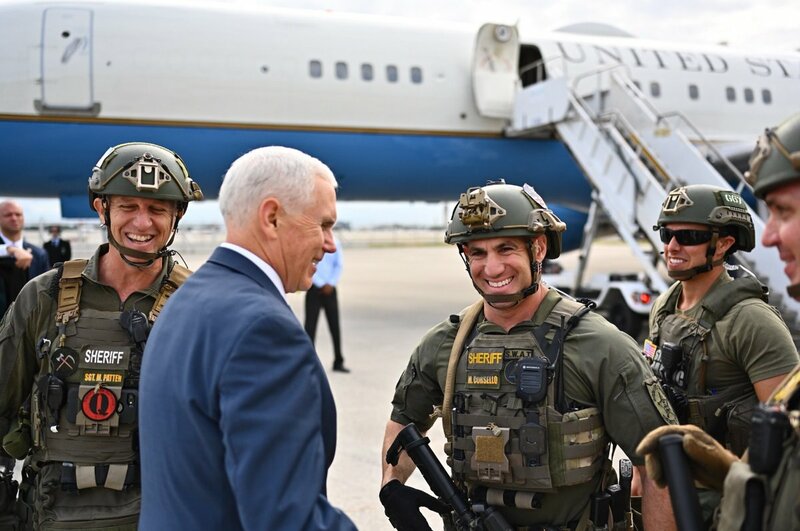 Here, for example, is a sergeant in the Broward County (Florida) Sheriff’s Department, name of Matt Patten (on the left), wearing just such a Q, situated chest-level on his full combat uniform. That elderly, white-haired gentleman in the blue suit in front of Patten, to whom Patten is giving a broad, toothy smile, is none other than the Vice President of the United States, Mike Pence. How did we get this startling photograph? From the Vice President himself, who tweeted it on Nov. 30. The picture didn’t last long; the Washington Post reported later that same day that Pence deleted it. How does a sergeant in the Sheriff’s Department of a major American county get to wear a white supremacist/conspiratorialist symbol in uniform while performing the official functions of his job—and at the same time greeting the sitting Vice President of the United States? Did Pence know about the symbol? Did Patten’s superiors know? Did they authorize it? Do they share the same rightwing, neo-nazi views as Patten? Will Patten be disciplined or fired (as I think he should be)? The Washington Post asked the Broward County Sheriff’s Department and Pence’s office these questions, but was blown off. I too would like to get in touch with Sheriff Scott Israel; his office apparently is not emailable, but here’s a general information phone number, if you want to call them yourself: 954-765-4321. We really need to get to the bottom of the facts. Is there a plot by professional militarists for an armed, rightwing insurrection in America? Let the Congress hold investigations, particularly now that the Trumpist cabal has been overturned in the House of Representatives. These neo-nazis may be small in number, but the opposite may be true: they may be metastasizing. It’s good that the public is becoming increasingly aware of them through the efforts of such civil rights groups as the Southern Poverty Law Center and brave investigative reporting by civics-minded journalists. But we need to thoroughly understand this phenomenon, if we are to prevent it from overtaking us. Wow! I wonder how he transported it. In his legal briefcase? If so, I hope it was lead-lined. That stuff is dangerous. The author of this article is just plain stupid. How he/she sees white supremacy in EVERYTHING is rather amusing. Since the lefties have taken away comedy, articles like these are the only source for laughs…it is even more funny when I believe these idiots actually believe what they write. Comedy reborn. The writer of this comment clearly continues to defend his fuhrer, despite near universal agreement on trump’s utter unfitness for the office. Indecency, vulgarity, lies, ignorance, vengeance, personal enrichment–who would have thought the American presidency could sink into such a sewer? It bothers decent, respectable Americans a great deal, but apparently, not Mr. Sims, who appears to be just another rightwing extremist.